lope county, and Mr. Hopkins with his parents lived with this brother during the winter, when they took up a homestead in section five, township twenty-six, range five, (Bernett township) on which they built a log house, and lived here ten years. Their home was the stopping place for many coming to Nebraska in the early days, and it was known as the Half Way House. April 16, 1884, Mr. Hopkins was married to Miss Minnie Nelson fourteen children have been born to them, as follows: Emma, Clyde, Andy, Hazel, Ernest, Harry, Edith, Ivan, Myrtle, Viola, and Harold. John deceased in 1902; Josie, deceased in 1892 and Willard, 1897. Mr. Hopkinns [sic] had many hardships in starting out for himself, and among other experiences went through the hailstorm of 1895, losing his entire crops, and in 1894 the hot winds killed all of his crops. In 1907, Mr. Hopkins bought his present home of two hundred and forty acres, and it is a well improved farm and known as the Frisbec hometead [sic]. Here our subject and his family reside and enjoy the respect and esteem of all who know them. ALBERT R. DOWNING, M. D.
Dr. Albert R. Downing, of Merna, is one of the best known physicians of Custer county and has one of the largest practices in his profession in central Nebraska. He is a native of Camp Point, Illinois, born July 27, 1861, third of the children of William and Mary (Bates) Downing, who were parents of three sons and two daughters. One brother of Dr. Downing, Joseph, is also a physician and surgeon, and lives at Rising City, Nebraska. Dr. Downing was educated in the common schools of Camp Point, and in his seventeenth year began a college course at Lincoln, Illinois, remaining there two years, after which he spent one year in college at Valparaiso, Indiana. He later studied medicine at Quincy and graduated from the Quincy (Illinoi) [sic] Medical College March 10, 1886, after which he located in Waco, Nebraska, for the practice of his profession. In 1895 he left Waco and came to Merna, and is now the oldest practitioner of that town. He has built up a splendid practice through his ability and standing in his profession, and this extends over a large field. Dr. Downing was married in Waco, April 11, 1888, to Miss Emma Stickler, daughter of Joseph W. and Nancy Stickyer [sic], pioneer residents of Waco, who came to Nebraska in 1876, and two children have been born of their union, William, born in the town of Henderson, York county, now sixteen years of age, and Howard, who has reached the age of fourteen years, both young men of promise. Dr. Downing and his wife are well and favorably known in educational and social circles and he is a member of the state and county medical societies, in which he has taken a prominent part. He served some years ago as county physician of Custer county. Mrs. Downing's mother and two of her sisters reside in York; her brother George B., is now pastor of the Presbyterian church of Ansley, Nebraska, and another brother, T. J. Strickler, is president of the state conference of the Methodist Protestant church and lives in Kansas City. Ole Johnson, now living retired from active life in Broken Bow, Nebraska, has long been a resident of Custer county and was the first settler in Round Valley, where for many years he was a successful grain and stock farmer. Mr. Johnson is a native of Norway, born January 15, 1845, the eldest of seven children. He has two brothers in Wisconsin, a sister in Wisconsin, and others of the family still live in Norway. When nine years of age Mr. Johnson came to America with relatives, who located in Dane county, Wisconsin. He received his education in the public schools of that state and on January 20, 1863, at Winona, Minnesota, enlisted in Company D, Third Minnesota Infantry, in which he served to the close of the war, and received his discharge at Fort Snelling, September 2, 1865. The most important battles in which he participated were the siege of Vicksburg and the battle of Little Rock, Arkansas. He also took part in many minor engagements and skirmishes and won a creditable record. At the close of the war Mr. Johnson engaged in farming in Minnesota, and he was married at Faribault, that state, May 20, 1870, to Carrie Chelson, also of Norwegian birth, who had been brought to America an infant and reared in the state of Wisconsin. She now has two brothers and two sisters in Minnesota, and another sister, Mrs. John A. Taylor, lives in Berwyn, Nebraska. In June, 1880, Mr. Johnson came with his wife and four children to Custer county and took up a timber claim of one hundred and sixty acres of land on section twenty-seven, township nineteen, range nineteen, in Round Valley, later securing a homestead of the same size adjoining. He lived on this place, improving it and adding to his holdings from time to time, until he now owns four hundred and eighty acres of land which is well improved and equipped and considered one of the best farms in the neighborhood. He was an energetic and successful operator and in 1908 was able to retire from farm life and move to Broken Bow, where he purchased a comfortable residence. He helped to organize school district number sity-six [sic] and served on the board of same. He is a progressive citizen, intelligently interested in local issues and events, and closely identified with the development of his town, county and state. He is a self-made man in the strict sense of the word and is held in general respect and esteem by all who know him. He has passed through a most interesting period of Nebraska's history and has made the most of his opportunities along various lines. Mr. Johnson and wife have had nine children, namely: Peter C., of Round Valley, has three children; Julius C., also of Round Valley, has four children; Henry G., is at home; Clemmie, wife of Adolph Ellingson, of Round Valley, has six children; Annie, wife of Edward Oleson, of Round Valley, has five children; Minnie, wife of Ole Chelson, lives in Broken Bow; Clara and Steven O.are at home; one son died in infancy. A picture of Mr. and Mrs. Johnson will be found on another page. 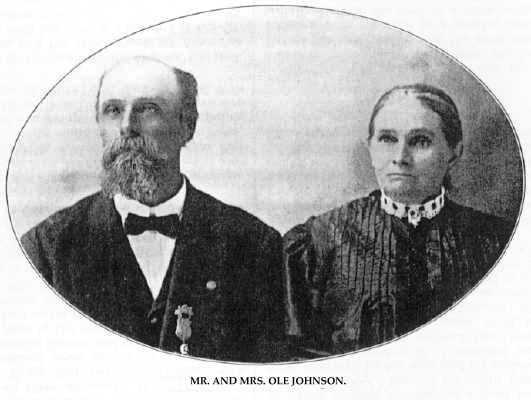 Mr. and Mrs. Ole Johnson. Charles A. Munger, a progressive and enterprising farmer of Pierce county, Nebraska, is one of the very earliest settlers of this regon [sic]. He resides on his pleasant farm in section thirty, township twenty-seven, range four, where he has succeeded in building up one of the valuable estates of the locality, and is considered one of the substantial agriculturists of the community. Mr. Munger was born November 10, 1854, in Rock Island county, Wisconsin, and is the son of George and Mary (Farnsworth) Munger, the father being born in New York, and died in 1894 at the advanced age of eighty-two years; and the mother was born in Vermont January 18, 1824, and lives with our subject. Charles A. Munger lived in Wisconsin twenty-five years. He came to Pierce county, Nebraska, coming by rail to Norfolk and driving from there to where he located a farm September 4, 1879, moving on the place in February, 1880. He had the house framed ready to put together in Wisconsin, and erected it himself. His family came in May, 1880. Mr. Munger has gone through all the hardships and privations endured by the early pioneers of this western country in its first days of settlement, among other experiences his crops being destroyed by hail in 1890. He got only fifty bushels of corn from one hundred acres. In the hailstorm of June 10, 1880, his house was blown eight feet off its foundation. Mr. Munger was luckily at home at the time of the blizzard of October, 1880. A daughter was at school during the blizzard of January 12, 1888, and remained all night. For two or three years after coming to Nebraska, the family burned hay, but burned but little corn. Mr. Munger hauled some wood from Bazile creek and some from the Elkhorn river, each twenty miles from home. Mr. Munger was united in marriage to Miss Laura Lane, November 7, 1875, and to this union have been born five children, whose names are as follows: Winnie. who lives in Pierce county, married Gilbert Staley and has five children; Minnie, who lives in Antelope county, married William Crippen and has one child; Pearl, who lives in Antelope county, married Frank Young and has two children; Vernon and Alta. Mr. Munger has three hundred and twenty acres of good land, half of which is in Antelope county. He is a member of the Woodmen lodge, and is independent in politics. He and his family are highly esteemed and respected in the community in which they live. Carl L. Petersen, widely and favorably known as an active public spirited citizen of Howard county, Nebraska, is a man of broad experience, and one of the prominent early settlers of that section. For the past ten years he has been retired from active work, making his home in Dannebrog, where for three years he held the office of marshal of the town. Mr. Petersen was born in the town of Nestved Denmark, on July 12, 1841. At the age of twenty he entered the Danish army, becoming a member of the Seventh Regiment Infantry, Company three, and served up to August 12, 1864. He was married in his native country in 1868 to Christina Jensen, and the following year they came to America. After landing in this country they went directly to Wisconsin and remained for about two years, then came to Nebraska, locating in Grand Island, where Mr. Petersen engaged in the mercantile business which he carried on for about a year, then removed his interests to Dannebrog and operated his store at this place up to 1884, when he quit and purchased a farm near Dannebrog. This he devoted to grain and stock raising and was very successful for fifteen years, building up a good home. About 1900 he again moved into Dannebrog, and has made his permanent home here since that time. Mr. and Mrs. Petersen have had a family of five children four girls and one boy namely: Marie, Amy, Sophie, Elvira and Waldmier, the last mentioned being deceased. Mr. Petersen, while living on the farm, was connected with the school board of district number seventeen, and held the position of postmaster at Dannebrog during 1882, 1883 and 1884. In this way he became familiar with all who lived in the vicinity and is one of the best known men of his county. Charles S. Burdick, a substantial farm worthy citizen of Valley county, Nebraska, resides on section two, towsnhip [sic] nineteen, range fourteen. He and his father before him are pioneers of the locality and have materially assisted in its development and advancement. Charles S. Burdick was born in Erie county, New York, July 28, 1878, and was second of four children in the family of Rouse and Eliza Burdick who had four sons: George, Charles, Ray, and a son who died in infancy. ter of section two, townsbip nineteen, range fourteen, and Charles Burdick, the subject of this sketch owns and resides on this original home farm. Mr. Rouse Burdick died in Ord in December, 1891, survived by a widow and two children, Charles and Ray, both of whom live in Valley county. Mrs. Burdick, our subject's mother, remained a widow for some time, and then remarried and now resides in Ord, Valley county, and is now Mrs. S. G. Dumound; of this second marriage one child was born. Charles S. Burdick, the principal subject of this sketch, grew up in Valley county from his fourth year, and the old homestead farm was his home during all the years of his residence here. He is a farm boy, receiving the usual educational advantages, and is now one of the successful young men of Valley county, having a fine grain and stock farm, and he makes a specialty of a good breed of hogs. Mr. Burdick was married to Miss Lily Parks in Ord, January 1, 1899; Miss Parks is of an old Valley county family, and was born in Valley county. A sketch of the Parks family appears on another page of this work. Mr. and Mrs. Burdick reside on their farm, and are well known among the younger people of Valley county, and enjoy the respect and esteem of a large circle of friends. They are progressive young people along all lines, giving their encouragement to all educational and progressive propositions. Mr. Burdick is a good citizen, and is active in everything pertaining to the progression of his home county and state. To the men of perseverance and stalwart determination who went to Nebraska when it was yet undeveloped as an agricultural and commercial region, the present prosperity enjoyed there is due. Among the early settlers of Madison county who have been intimately identified with its development and have gained enviable reputations as citizens, may be mentioned Andrew Nahrstedt. He resides on section thirteen, township twenty-two, range one, west, where he and his family are surrounded by a host of good friends and acquaintances. Mr. Nahrstedt is a native of Canada, born August 9, 1872, the son of Henry and Caroline (Burmeister) Nahrstedt; his father dying in 1875, when our subject was but a small boy. In 1876, he and his mother came to Madison county, Nebraska, where they took up a homestead and a pre-emption claim and built a frame house. Here the little family endured many hardships and privations; many times fought prairie fires to save their lives and home; and as late as 1894 the entire crops were destroyed by the hot winds that prevailed during the drouth of that year. In the first days of settlement Columbus was the nearest market place. Antelope and deer were plentiful in those days and were frequently seen brousing around. Mr. Nahrstedt bought his present farm in 1895, and has lived there continuously since, and is well and favorably known in his community. Mr. Nahrstedt was united in marriage in 1894, to Miss Sarah Anderson, and Mr. and Mrs. Nahrstedt are the parents of six children, whose names are as follows: Archie, Clarence, Harold, Iola, Roy and Waldo. They are a fine family and enjoy the highest respect and esteem of all who know them, and their friends are many. Charles J. Mytton, a substantial and successful fruit grower, farmer, gardener and stock raiser, of Custer county, Nebraska, has taken an active part in public affairs in his community. He was born near Welshpool, in Shropshire, England, March 4, 1856, the only child of Charles and Mary (Evans) Mytton. He was educated in local schools and learned the trade of shoemaker. In October, 1871, he came to America, in company with Thomas Morris, who has always lived with him since that time. Sailing from Liverpool, October 2, in the "Colorado," they landed at Castle Garden, New York, fifteen days later. They located first at Blackstone, in Livingston county, Illinois, and were partners in a shoemaking establishment there for ten years. After his marriage in 1879, Mr. Mytton lived in Illinois until 1881 and then moved to Missouri, where he engaged in farming in Harrison county, near New Hampton, until 1886, the date of his coming, with his wife and two children, to Custer county. He purchased one hundred and sixty acres of land, comprising the northwest quarter of section twelve, township sixteen, range eighteen, which is still the home place, and is known as the Walnut Grove Stock Farm. He has developed his farm and improved it, until he has a well equipped stock farm, and makes a specialty of raising thoroughbred hogs. He has of late years given much attention to fruit growing and gardening. He has in his orchards two thousand apple trees, two hundred cherry trees, and one hundred plum trees. Of small fruits, he has eight hundred currant bushes, two hundred raspberry bushes, and two hundred grape vines. About twenty acres are given over each year to vegetables, for which he finds a ready market in all the surrounding towns. Mr. Mytton is a public spirited and representative citizen, and displays great interest in the prosperity and welfare of his community. For several years he has served as a member of the school board of district number sixteen. Morris Fitzgerald, was born in Ireland, and after coming to America enlisted in the union army from Illinois, and was killed in the Civil war. Her mother was born in Ireland and died in Dale. Nebraska, October 17, 1889. Mrs. Mytton has a half-brother, Joseph Wilson, who lives in Custer county. Mr. Mytton's father, who was a native of England, died there in 1900, and his mother, a native of Wales, now lives in England. Mr. and Mrs. Mytton have had ten children, as follows: Della, wife of Walter Lawrence, of Broken Bow, has two children; Mary, a teacher in Custer county, is a graduate of Boylis Business College, of Omaha, and of the Zenarian Penman College, of Columbus, Ohio; Margaret and Elizabeth, twins, both teachers, in Custer county schools; Alice C. and Eleanor M., both teachers; William, George D. and Anna S., at home. One daughter died in infancy. The entire family worship in the Catholic church. Mr. Mytton is a member of the Modern Woodmen of America. Thomas Morris, who came to America with Mr. Mytton, is an inmate of the household, the two men having been together constantly since leaving their native land in 1871. Mr. Morris, still hale and hearty, has reached the extreme old age of one hundred and seventeen years; he was born in Berrew, Montgomeryshire, Wales, January 15, 1794, and has lived in three centuries. In the autumn of 1911 a neighbor with a motor car came and gave him his first ride in a self-propelled vehicle. In his youth the usual means of locomotion was walking. Mr. Mytton was living north of Ansley in 1888, and on the day of the famous January blizzard was on his way to town with a load of corn. He made his way in with it, and remained over night. The dog that usually accompanied him became separated from his master and found his way home, causing great uneasiness until Mr. Mytton returned. A most terrifying experience of Mr. Mytton occurred while living in Missouri. A cyclone overtook him, which at times tossed him thirty to forty feet. He finally reached a place of safety, but was severely frightened and shaken up; the storm was so severe it tore great trees up by the roots. Mr. Mytton and family have lived in primitive style in dugout and "soddy" before being able to build a frame house, but managed to find some comfort withal. Bohemia has furnished Knox county a large proportion of its enterprising citizens, and several townships are made up practically of this happy, light-hearted, and industrious race. Like a long line of ancestors who cultivated a taste for music and art, Mr. Marshall is a violinist of more than local note. He heads an orchestra that is called upon to furnish music throughout the entire locality in which he lives, and is well-known to every person in Knox and the surrounding counties. Among the earliest of the Bohemian settlers in Nebraska, was Ignatz Marshall, senior, and his family of five boys. He was a fine musician, and trained his sons and a son-in-law thoroughly in the art of string music, especially the violin, so that even in the days of the greatest hardship that came to the family, music filled a large place in their lives and enabled them to enjoy many hours of happiness. He was born in Bohemia, grew up and was married there, and came to America in 1867, the family settling in Chicago. After two years spent in the latter place, they came on to Nebraska, father and sons securing tracts of land in the Niobrara Valley, Pishelville, where they suffered every form of pioneer hardship and privation, including scares from Indian uprisings, drouths, floods, grasshopper raids, etc. There were four sons in the family that came on to Knox county with their parents, Ignatz, junior, Frank, Louis, and Emil. Charles Marshall, who was the father of our subject, Fred C. Marshall, was born in Bohemia in 1854, and after coming to America with his parents, he remained in Chicago when they came on west. He was there at the time of the great fire, joining this relatives here the following spring, when he filed on a tract of land in the same locality. In 1886 Charles Marshall moved to Niobrara and opened a general store, which he operated up to the time of his death, which occurred on December 10, 1903, and in his demise the people of the community lost one of their popular citizens. His wife was Mary Lundak, also a native of Bohemia, who came to the United States in 1867. She now resides in Niobrara. Of their children, Fred C. is the second in order of birth, he first seeing the light on June 25, 1880, at Pishelville. The first seven years of his life were spent on the farm, when the family moved to town, where he attended the city schools, and during his hours from school assisted his father in the store. After his graduation from high school, in 1896, he secured a teacher's certificate, and for four years taught in the country schools, and for one year was employed in a store at Plainview. He was offered the principalship of the Verdigris schools, accepted the same, and spent two years and a-half at that point. In 1903 he was elected county superintendent of schools, and served for four years in that capacity. During 1908 he farmed near Verdigris, and on February 1, 1909, took charge of the Niobrara Tribune, which he had purchased a short time previous. This paper he is making a "live wire" in Knox county journalism, and is eminently fitted to efficiently fill the editorial chair. Nebraska. Mr. and Mrs. Marshall have one daughter, Beatrice. In 1910 Mr. Marshall, in company with other well-known men of his locality, promoted the improvement of the Niobrara Island Park, an island in the Niobrara river, which they are fitting up as a summer resort, he being the first to erect a cottage on the camp. This is a beautifully located spot, and promises to be one of the noted summering places in this part of the west, having been donated to the town of Niobrara by the government for park purposes when the Sioux Indian treaty of 1889 was made, and contains nearly seven hundred acres. Mr. Marshall is a republican and is active in local affairs. He is a member of a number of fraternal orders, including that of the Masons, Odd Fellows, Bohemian Benevolent Association, and with his family is a regular attendant of the Episcopal church. Henry Van Hoosen has made a good record as a citizen of eastern Nebraska, where he settled in 1870. Through all the pioneer struggles he has done his part in the upbuilding of the general interests of the community and has won the respect and confidence of his friends and neighbors. Henry Van Hoosen, is a son of William and Celinda (Woodward) Van Hoosen, and was born in Sparta, Livingston county, New York, August 15, 1835. He was third in a family of ten children. He has two brothers living in Polk county, Nebraska; and one sister residing in California. The mother died in 1874, in California, and the father in Merrick county, about 1893. In 1845, Mr. Van Hoosen went with his parents to Illinois, where Mr. Van Hoosen received the greater part of his education. The family were living within three miles of Nauvoo, a Mormon settlement, at the time of anti-Mormon uprising, which lasted several weeks before government troops were called upon to quell the trouble. On July 2, 1862, Mr. Van Hoosen was united in marriage to Miss Mary Moore, of Michigan, and later of Illinois. Mr. and Mrs. Van Hoosen have had ten children, seven of whom are living: Rosella, who married Cyrenus Fiandt, who died, and she later married Robert Phelps, and they live in North Yakima, Washington; William, a carpenter, married, and has one son, also lives in North Yakima, Washington; Ellsworth, deceased in 1873; George, deceased, June 21, 1880; John, a farmer, married, has one daughter, and resides on the home farm in Merrick county; Charles, a railroad engineer, married, has two children, and lives in Sterling, Colorado; Edward, a merchant, who is married, has two children, and resides in Scott's Bluff, Nebraska; Louis, deceased in infancy; Lilly, married William Powell, has two children, and resides in Angora, Nebraska; Margaret, wife of Harvey Moore, lives in North Yakima, Washington. In the spring of 1868, Mr. Van Hoosen made a trip to Nebraska, looking for location and filed on a homestead of sixty-five acres in Saunders county, seven miles southeast of Wauhoo. Two years later Mr. Van Hoosen brought his family overland from Illinois to his homestead farm spending three weeks on the journey. After twelve years residence there they sold the homestead and purchased one hundred and sixty acres in section nineteen, township thirteen, range six, west, in Merrick county, mostly under cultivation, where they lived until 1905, when Mr. Van Hoosen retired from the farm and moved to Central City and purchased a good home, where they now reside. Our subject served as director of his school district number forty-eight for several years. Mr. and Mrs. Van Hoosen are among the earliest settlers of this portion of Nebraska, and are widely and favorably known. They have passed through all the trying experiences and hardships of pioneer days. Mrs. Van Hoosen's father died in June, 1886, and the mother in August, 1902. She has one brother residing in Kansas, four brothers in Illinois, two sisters in Illinois, and another brother in Iowa. through with their furniture, and the train in which his car was made up was wrecked. By quickly jumping through a window of the car, the father's life was saved. After settling in their Nebraska home, hardships and misfortunes relentlessly pursued them; grasshoppers devastated their crops for three years in the seventies, leaving hard times and want in their wake; prairie fires frequently came racing down onto them, and one time got so far beyond their control that the sills of their house took fire, but was fortunately extinguished before any great damage was done. Deer and antelope were to be seen in the country when the senior Mr. Anderson settled with his family in Nebraska, sometimes coming into the door yard. The eighty-acre homestead was sold after a few years, and a tract of one hundred and sixty acres purchased. The mother's illness for three years during the eighties set the family back to such extent that popular subscription was gathered by the neighbors to defray a part of the doctor bills, but her partial recovery made the family happy again and now hopes of the future were entertained. During these three years, Carl, was cared for by neighbors and came near being adopted by one of those families. Through dire and brighter years the family continued their residence in this same place until in January of 1893, when two of the sons came to Wausa, being followed here in March of the same year by the father and mother, the latter making this their home until death. The father passed away November 13, 1896, the mother October 6, 1909. Their five children are: J. Albert, farmer and stock raiser, living north of Wausa; Frank Edwin, editor of "Omaha Posten," at Omaha, Nebraska, a weekly Swedish newspaper devoted to the interests of the Swedish Americans; Theodore, a merchant of Wausa; Cecelia Gertrude, wife of Charles S. Erickson, farming one mile north of Wausa; and Carl August, the subject of this sketch. Carl August Anderson was born at Mead, Saunders county, Nebraska, August 25, 1879, and lived there until May 30, 1893, when he joined the family in Knox county. Mr. Anderson attended the common schools of Saunders county and later the schools of Wausa. In 1895 he began learning the printers trade and kept at the case for eight months, when he returned to the farm and worked a year and a half. He next worked a couple of years in Wausa, learning harness making, and then clerked for sixteen months at Wakefield, Nebraska. On January 1, 1901, he bought a half interest in the "Wausa Gazette" of Mr. J. E. Baggstrom, who had established the journal in partnership with Frank Edwin Anderson, now editor of the "Omaha Posten." The brothers were associated in the publication of the "Gazette" until January 1, 1904, when Carl purchased the entire interest in the paper, and his brother moved to Omaha to take up a wider field of journalism. He edits a live country paper full of news and a goodly amount of display advertising. His job work ranks well to the front as compared with work turned out by country shops, and he enjoys a liberal patronage as his products of "the art preservative" well merits. Mr. Anderson was appointed postmaster of Wausau, January 1, 1908, and is serving his first term to the satisfaction of all those receiving mail at that office. Mr. Anderson was married at Mead, Nebraska, August 31, 1904, to Miss Olga Elenore Monteen, a Nebraska girl. She is a daughter of Gust and Ingrid (Berg) Monteen, both hailing Sweden as the place of their nativity. Mr. and Mrs. Anderson are the parents of two children, Rupert Cedric and Gordon Vladimir. In politics Mr. Anderson is a staunch republican, and through the "Gazette" gives healthy support to the party candidates. Like many of his people, he is a member of the Swedish Lutheran church, and is putting in some earnest work in promoting this good cause, having acted as leader of the local choir for the past eight years, and also been associated with any other musical organization within the church. William Weitzel, son of Godfrey and Marie Weitzel, was born in Bergen, Germany, July 20, 1840, and was fourth in a family of twelve children, three brothers of whom reside in America, and three in Germany, the others being deceased. The parents are also deceased, having died in Germany, the father in 1896, and the mother in 1859. In 1852, in company with an elder brother, Julius, Mr. Weitzel came to America, going to Lancaster county, Pennsylvania, where he made his home with his uncle, Jacob Weitzel, for four years, during which time he worked on a neighboring farm for one year for five dollars a month and at the end of the year his savings amounted to forty dollars. In 1856 he went to Cincinnati, Ohio, where he was engaged in the grocery business one year, and in 1858 went to Marshall county, Illinois, where he and his brother were engaged in the retail grocery business until 1866, and in January, 1866, he went to Chicago. In Chicago, on September 9, 1867, Mr. Weitzel was married to Miss Emma M. Mayer, who was a native of Marshall county, Illinois. They are the parents of two children; Frederick M., who is married has two children, and lives in Albion, Nebraska; and William C., who lives in San Francisco, California. served his county as superintendent of public instruction four years, served as justice of the peace two years, and as assessor four years, and has been a director of the Albion National Bank since 1890, and since 1899 has been treasurer of Albion school board. In May, 1864, Mr. Weitzel enlisted in Company F, One Hundred and Thirty-ninth Volunteer Infantry of Illinois, serving until close of the war, and received his honorable discharge November 1, 1864. Mr. Weitzel is now living in Albion, where he has a fine home, and is conducting an abstract and insurance business. James W. Voorhies, an agriculturist of prominence in Antelope county, Nebraska, resides in Royal township and is one of those substantial citizens whose integrity and industry, thrift and economy have added so materially to the wealth and growth of Nebraska. Agriculture forms the basis of wealth in all countries of the world, and it is thereford of great importance that the class of people who inhabit the great farming regions should represent those elements of sterling worth so prominently displayed by the majority of the early settlers of the west and their descendants. Mr. Voorhies is a worthy citizen and a good neighbor, and richly deserves all the success which has come to him. Mr. Voorhies was born in Tama county, Iowa, July 16, 1855, and lived in that vicinity until he came to Nebraska in March, 1887, receiving his education in the country schools of Iowa. Mr. Voorhies' father, G. W. Voorhies, was born in 1830 in New York, and is a descendant from Holland; and our subject's mother was born in 1832, also in the state of New York, her maiden name being Calista J. Dingee. On April 4, 1883, Mr. Voorhies was united in marriage to Miss Laura E. Ferguson, and Mr. and Mrs. Voorhies are the parents of eight children. whose names are as follows: Wilber R., Anna E., George S., Mary C., Alfred W., C. Walter, Laura M., and Lucy M.
In the year of 1887 Mr. Voorhies with his family came to Nebraska and bought a relinquishment on a timber claim from Mr. A. E. Jones, and there started to make a fortune for himself, and has succeeded to a fair degree after various difficulties and discouragements. On June 23, 1889, they suffered losses through the hail storm of that date, and reaped only about one-third of their crops, August 11, 1895. Again on August 23, 1900, they experienced another severe hail storm which killed almost all of our subject's young fruit trees, as he had a fine orchard started. The year of 1894 was the year of the great drouth, and is vividly remembered by all who were here at that time, as all suffered alike. Mr. Voorhies relates that on July 28 of that year the thermometer registers one hundred and ten degrees in the shade, and the wind at the time was blowing a hurricane. On July fourth of that year a great prairie fire started and swept over miles of this country. This shows how dry the grass was at that time, as it would be almost impossible at the present day for such a fire to gain a start. In those early days they had no wood to burn, and they were compelled to burn corn and hay to keep warm. But those days are passed and Mr. Voorhies now possesses a fine property of three hundred and twenty acres of land which is a well-improved farm, and has seven acres of shade trees, and also fruit trees. Wesley M. Vannice was one of the pioneer settlers of Custer county, and is one of the very few who came in an early day to occupy their original homesteads through all the years. He was born in Des Moines county, Iowa, July 1, 1847, the youngest child of Abraham and Elizabeth (Domiree) Vannice, who had five sons and four daughters. He was reared on the farm where he was born and received the ordinary common school education usually received by a farmer's son of the locality. He remained on this farm until his enlistment August 13, 1863, in Company M, Eighth Iowa Volunteer cavalry, in which he served two years to a day, receiving his discharge August 13, 1865. He was with Sherman during the famous march to the sea, and also served under General Thomas. At the time of his muster out, at Macon, Georgia, he was chief cavalryman under General Wilson. Mr. Vannice participated in the battles of Kenesaw mountain, Dalton, and various other engagements, while serving under General Sherman, and while under Thomas was before Nashville, and in the two battles of Franklin, twenty miles from Nashville, with General Wilson he took part in the Wilson raid during the spring of 1865, going through Alabama and on to Macon, and he served with Sherman from Chattanooga to Atlanta.